Bonnieview Farm is a sheep and cow dairy located in the Northeast Kingdom of Vermont, and has been in the Urie family for four generations. The farm is a mixture of rolling pasture, hay fields, and woods, where Neil, Kristin, Tressa Urie and the triplets live and farm. Neil's great-grandfather first bought the farm in 1890, and it was primarily a cow dairy for many decades, with pigs and sheep and horses as well. Neil's grandfather and father were both born at the farm. Neil bought Bonnieview Farm in 1995 from his uncle who was a traditional cow dairy farmer, because he did not want to see the farm leave the family. The Urie’s milk 180 ewes that they rotationally graze from May to October and make three kinds of cheese with the milk. In August 2013 they started milking 15 cows. They raise lambs for meat, and make various products with their wool and sell individual fleeces to spinners. In addition to the sheep, they have a breeding pair of pigs, a flock of laying hens, two cows, a llama, a dog and a cat. As Neil has expanded his farm to include more cows, he has gradually developed three types; cheese made from 100% raw sheep milk, cheese from 100% raw cow milk and now he has launched a mixed milk category. Paisley Blue is modeled after the sheep milk Mossend Blue, made in the same mold and with a similar profile; creamy yet not wet, slightly crumbly, with a lot of mild bluing. 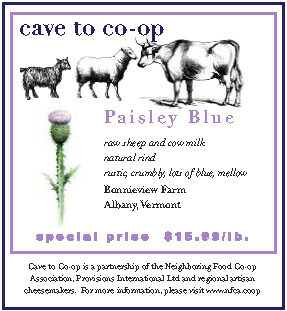 The cow milk mellows the flavors and the result is a simple, beautiful, rustic and authentic blue. We think that Paisley Blue is wonderfully suited to the kitchen and the upcoming holiday gives us all an opportunity to utilize its qualities in cooking. Here are some seasonal recipes that range from the simple to the simply sublime, and taken together are the makings of a non-traditional but delicious Thanksgiving meal for the blue cheese lover. Place fig halves in a small baking dish, cut side up. Make a small indentation in each with the back of a teaspoon. Evenly distribute the crumbled cheese into the hollows. Bake for 10-15 minutes until the figs are hot and caramelized and the cheese is melted. Remove from the oven and drizzle with honey. Serve. If you are an eater of pork you can, after you distribute the cheese, wrap each fig in a thin slice of prosciutto and secure with a toothpick. Raise the oven temperature to 425°F. Bake the figs for 10 minutes or so to melt the cheese and crisp up the prosciutto. Drizzle with honey or balsamic vinegar. Either way, these are delicious! Pre-heat oven to 350° F and line a baking sheet with parchment paper. You can either make these in a food processor by placing all the ingredients but the jam into the bowl and processing until the dough just comes together and starts to form a ball. If making by hand, place those same ingredients in a bowl and mix with a spatula until blended. Form into a ball. Place the dough on a lightly floured surface and knead a few times to make sure it has come together. Roll the dough out to 3/8-1/4 inch think and cut out rounds with a 1” floured cookie cutter. Transfer the rounds to the parchment covered baking sheet. Re-roll the scraps and repeat. Using the back of a spoon, make a small hollow in the center of each dough circle. Spoon about ¼ teaspoon jam into the hollows. Bake until the jam is bubbly and the pastry is light golden brown, around 12 minutes. Cool on the baking sheet for at least 10 minutes then move to a rack to finish cooling. Preheat oven to 375°F. Generously season each chicken breast with salt and pepper. In a large, oven-proof skillet heat 1 tablespoon olive oil and sear breasts 2 to 3 minutes each side until lightly golden. Place pan in oven and bake until chicken is cooked through, about 15 minutes. While chicken is cooking, heat 1 tablespoon olive oil in a large pan over medium heat and sauté red onion until just softened, 2 to 3 minutes. Add spinach and toss until wilted. Season with salt and pepper and transfer to a large platter or divide evenly between 4 plates. Wipe out pan and heat remaining 1 tablespoon olive oil with vinegar. Add pears and gently heat until warm and slightly caramelized. Stir in parsley. Arrange cooked chicken breasts on spinach. Top with warmed pear slices and about 2 tablespoons blue cheese per breast. Cover potatoes with cold water in a large pot. Add salt and bring to a boil, then reduce the heat to medium and cook until they can be easily pierced with a fork. While the potatoes are cooking, warm the cream and butter in a small saucepan until melted. Add the cheese and stir together. When the potatoes are cooked, drain well, and then add back to the pot they were cooked in. Add sauce to potatoes and mash until smooth. Add salt and pepper to taste and top with the chives. Toss the potatoes with the olive oil and salt and pepper. Spread on a baking sheet and roast for 20-30 minutes, until golden brown and tender. Remove from oven and sprinkle evenly with the crumbled cheese. Return to oven and cook until the cheese is melted. Cut the sheet of pastry in half, and place it on a baking sheet lined with parchment paper. Reserve the other half for another use (or make 2 tarts!). Using a paring knife, score a line all around the edge of the pastry about 1 inch from the edge to make a border. Use a fork to prick holes inside the border so that the dough will remain flat inside and puff up at the border. Combine the almonds, sugar and ½ tablespoon of water in a food processor and grind to a paste. Spread the paste evenly over the pastry inside the border. Arrange the pear slices over the almond paste. Drizzle with honey and crumble the blue cheese evenly over the top. Lightly brush the border with the egg wash and bake until the pastry is puffed and golden brown, 30 minutes. Let cool slightly before slicing and serving.